Are you sick and tired of only being able to play bits and pieces of songs on your guitar? Are you frustrated and fed up when it seems to take forever to learn an entire song, if you even get there at all? You are not alone here. This is actually a very common problem and as logical as it may seem, trying to learn a song on guitar from the very first bar to the very last is NOT the best way to get the song down. In fact, taking this approach will always end up in frustration and you still not being able to play the song all the way through. 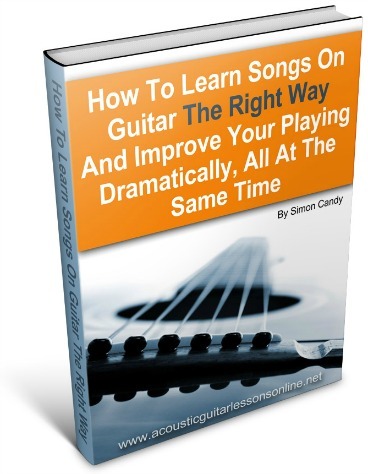 Are you finally ready to learn exactly HOW to play songs on your guitar? In order to not only be able to play a song all the way through seamlessly, but to also dramatically improve your guitar playing skills, you will need several very effective methods of how to go about this. Have a systematic approach that you can apply to any song in any style of music to effectively get it down and get it down for good!